As the cool air swaddles nature, welcoming the fall with a crisp autumnal embrace, the scent of magick permeates the atmosphere. We sense it in the trees, the way their orange leaves sway upon the branches one last time before taking flight, fluttering to the ground in a ritualistic dance of fall-painted beauty. We can feel it on our skin as the weather turns dry and nature softly exhales, hinting at the impending winter with sacred, frost-laced breath. Above all, we feel it in our souls, the way The Wheel churns around us, humming with life as the veil thins and the world brims with magick just before its winter slumber. Autumn is undoubtedly a special time of year. It's a cozy cluster of days celebrated with the comfy aspects of life—luscious slices of gooey apple pie, soft woolen blankets clutched across our shoulders on dreary October nights, pumpkin bread and cinnamon coffee and hay rides and corn mazes and haunted houses! Whew, getting a bit winded over here. Just so darn pumped! 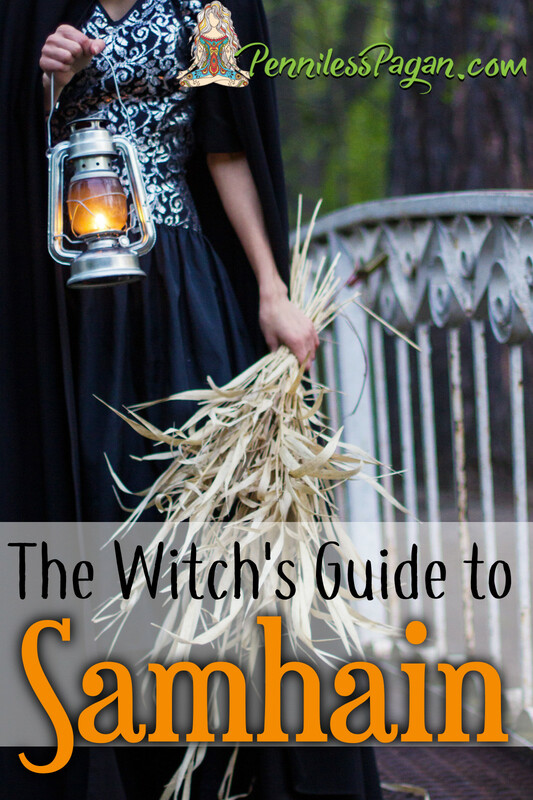 If you're new to Paganism or simply need a brush-up, let's sit down together over a mug of London fog tea and a slice of banana bread while we discuss The Witch's Guide to Samhain! Samhain (pronounced sow-in) is a cross-quarter sabbat that is celebrated on October 31st. On this sabbat we honor the death of the God, acknowledge death as a necessary stage in the cycle of life, and celebrate our ancestors and those loved ones who have transcended before us. Just as The Wheel turns, demonstrating that nothing in this realm is constant, our lives too will eventually cease, though our souls remain eternal. We acknowledge this unconditional truth on Samhain and address our own discomfort that often accompanies our mortality. As Samhain nears, the veil between our plane and then next thins to near transparency, granting us easier communication with those beyond. Now is the time to honor your loved ones, letting them know their life on this earth may have ended but your love for them has not. 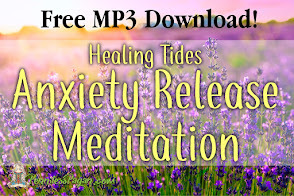 This post has five meaningful (and cost-free!) ways you can honor your ancestors on this sacred night. In an altar kind of mood? Check out my Natural Samhain Altar and let nature guide you! 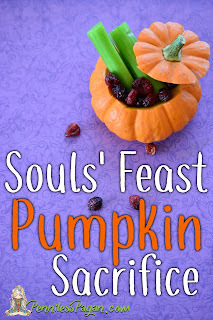 Or make a super simple Souls' Feast Pumpkin Sacrifice. Although we are honoring the proverbial death of the God (who will be reborn on Yule, the Winter Solstice), we are also aware every ending is a new beginning. 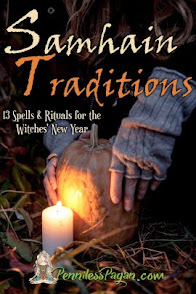 Thus, Samhain is often referred to as the Witches' New Year. 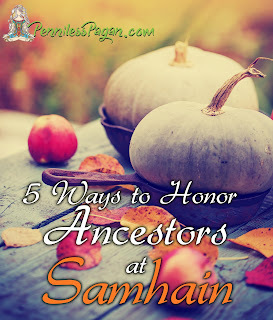 And because the veil is thin, gifting us with heightened energies from the other side, Samhain is commonly seen as a time for divination and foretelling. 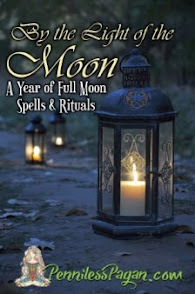 Cast runes, try your hand at scrying, or break out your tarot deck to see what the coming year holds. Looking for some inspiration? 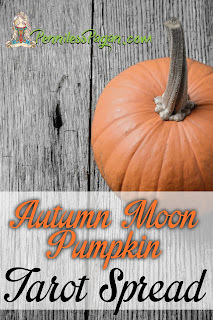 Take a peek at the Autumn Moon Pumpkin Tarot Spread! Just as we observe in nature, life is about balance, which is why this somber sabbat doesn't have to be all melancholia and sorrow. Decorate your home in red, orange, and yellow hues (representing the sun, which represents the God) as well as black and brown, which signifies death and our return to the earth. Seasonal vegetables such as pumpkins, winter squashes, apples, pears, and cranberries are all appropriate treats for your Samhain feast. Feeling sentimental? Treat yourself to the tart red flesh of a pomegranate, which is a Greek mythological symbol for the underworld. Legend says leaving a pomegranate outside your door on Samhain night protects your home and family from evil in the coming year. 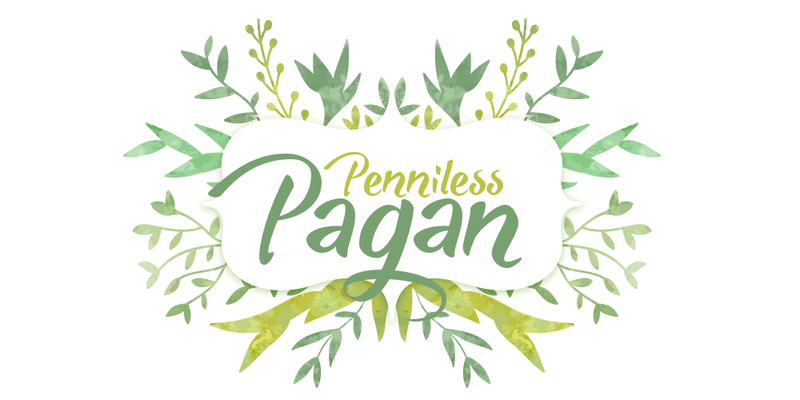 Lastly, I just wouldn't be the Penniless Pagan if I didn't give you a few good tips on how to celebrate without spending a dime. And since I like you, I'll do you one better! Here's ten ways to celebrate without spending a dime! 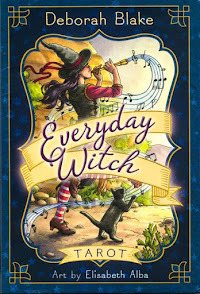 Whether you choose to spend your Samhain with candied apples and rowdy children, or you settle in for a quiet evening of deeply spiritual ritual, I hope you have a wonderfully magickal Samhain eve! 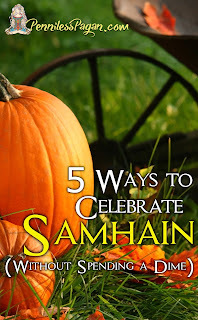 How do you celebrate Samhain: fun and gleeful, sweet and somber, or a little of both? What a lyrical, delicious opening paragraph! 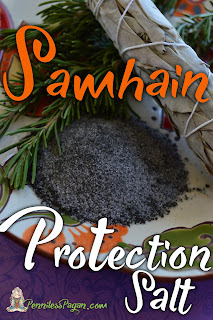 Just reading this post made me feel the magic of Samhain. I'm looking forward to this Samhain much more than ever before, especially its deep spiritual aspects, because of my recent loss. I'm still making Halloween costumes for me and the mini, and we're still doing the spooky movies month and trick or treating. But I'm putting aside much more time and effort this year to honor the departed loved ones. 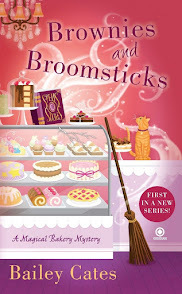 I'll be using many of your ideas from the book and from your blog. Thank you, Michaela! 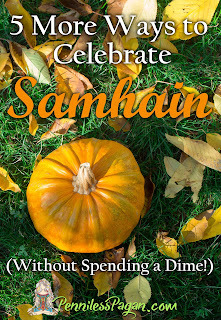 Have a blessed Samhain! I'm so glad I've found you! 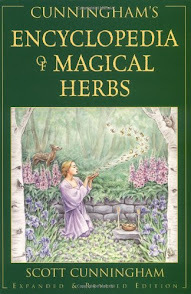 I am very new to being a Pagan & finding my feet when it comes to rituals etc. I found your page as I was looking into ways to help me through my grief for my soul mate, my dog who died 3 weeks ago. The article made so much sense & then it lead me to this article, which is just perfect timing! I'm glad you found the blog when you needed it, and thank you for your support! I'm looking forwrd to Samhain! Lots of great ideas, thank you. I usually make a "Demon's Blood" drink (recipe is from Kate West's The Real Witches' Kitchen), have some buffet style food and bake gingerbread. Also light candles, and of course have a pumpkin!